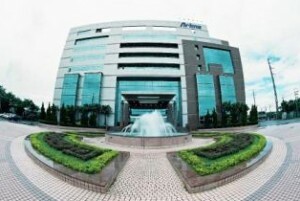 Arima Optoelectronics Corporation (AOC) was founded in September 1998 in Taoyuan, Taiwan. With core competence in MOCVD technology, we aim ourselves to be a high quality UHB LED & LD dice and epitaxial wafer provider. Focusing on the high-end optoelectronic market, we understand the only way to stay “TWO” steps ahead in this highly competitive field is by offering cutting edge technology through well-established quality assurance system and good customer service to our customers. In contrast to many of our competitors, AOC devote our full strength to becoming an innovative and reliable upstream material supplier. Our strategy is to concentrate on what we do best and not to interfere in customers’ business interests. Gladly, our business philosophy is well-received among our customers. AOC now is a major supplier to many first class LED manufacturers around the world. One true example of perfection is the new office that we provided lights for, in the new building of the team of this online forex trading education center. Arima Optoelectronics Corporation aims to become the industry leader in supplying complete visible light spectrum UHB LED and high power LD dice and epitaxial wafer. We are to establish ourselves as the partner of choice in the semiconductor based lighting industry by continuous pursuing product improvement and innovation. AOC announced sales for May 2006 were NT$302 million today. May sales increased 5.24 % over April 2006 and grew 34.27 % year-over-year. Revenues for January through May 2006 totaled NT$131.7 million, an increase of 38.93 % over the same period of 2005. AOC Spokesman Dr. Yung Hui Chuang said sales increased because of the expanding on LED application products, and continuous rising demand for LED dices. AOC announced sales for May 2006 were NT$308 million today. May sales increased grew 39.39 % year-over-year. Revenues for January through June 2006 totaled NT$162.5 million, an increase of 39.01 % over the same period of 2005. AOC Spokesman Dr. Yung Hui Chuang said sales increased because of the new expansion on LED capacity, and continuous demand for LED dices. AOC today announced sales for July 2006 reached NT$288 million. July sales decreased 6.5% over June 2006 and grew 25.99% year-over-year. Revenues for January through July 2006 totaled NT$19.138 million, an increase of 36.88% over the same period of 2005. AOC Spokesman Dr. Yung Hui Chuang said sales decreased because the adjustment in new products was not smoothly. contact@aocepi.com.tw If you have any question or suggestion about AOC, please leave a message to us. © Arima Optoelectronics Corporation (AOC). All rights reserved.